It's very rare for my husband to ask me to cook something and he's always very appreciative of whatever I put in front of him. And even more appreciative if he didn't have to do anything to bring it to fruition. If I ask him for a farmaaish, it's almost always khichadi, not to be confused with kichadi, and potatoes in a sweet and tangy tomato sauce. Needless to say, I've stopped asking him. So when he came up with Bedouin Mensaf Lebeneh as one of the dishes he would like to eat in this lifetime, I was really taken aback. Not only had he asked for something other than khichadi, but this was a dish that had meat in it. Given a choice, he prefers to be a vegetarian but has learned to eat fish and meat because of me. He had first heard of Mensaf Lebeneh when I had read him excerpts from Diana Abu-Jaber's The Language of Baklava. The violent story of the botched-up killing of the lamb, followed by the recipe for a Peaceful Vegetarian Lentil Soup got him hooked. He read the book from cover to cover. He even approached my Bosnian neighbor who, from time to time, has goat carcasses hanging in his garage. According to Medha, the dead goats keep looking at them while they play. 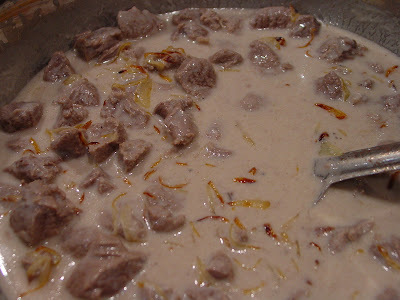 Bedouin Mensaf Lebeneh is best when made with goat meat or mutton, as it is called in India. I made it with lamb, the more readily available meat in these parts of Colorado. In a large pot, place the lamb and add water until the lamb is covered. Bring to a boil. Turn down the heat and simmer for 20 minutes or so. Skim off any fat that drifts to the surface, leaving behind a lamb broth. In another large pot, stir the egg into the buttermilk and bring to a boil over medium heat. Stir constantly or else the buttermilk will curdle. Reduce the heat to a simmer and continue stirring, for about 20 minutes. Add just the lamb pieces to the buttermilk mixture. Do not discard the broth. Add 1 cup of the lamb broth to the buttermilk mixture and stir thoroughly. Simmer this lamb mixture for about 1 hour, stirring occasionally. 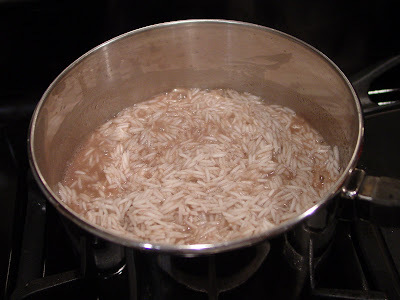 In the meantime, cook the rice in 2 cups of the lamb broth, adding salt to taste. In a saucepan, sauté the onions in 1 tbsp of butter until they are lightly browned. Add these onions to the buttermilk mixture toward the end of the cooking. Layer the pieces of pita on the bottom of each plate and pour enough of the buttermilk mixture to soak the bread. Spread the rice over the bread in a low dome. Place the lamb pieces over the rice and pour more buttermilk over the meat. Don't let it become soupy or runny. Keep the extra buttermilk sauce to serve on the side for those - like me - who would like more. In another (yes, 4th!) small pan, sauté the pine nuts or almonds in 2 tbsp butter until the nuts are lightly browned and sprinkle them over the meat. Dot the whole dish with slices of the remaining butter before serving. Needless to say this is a very rich dish! I used as little butter as possible and also eliminated the egg yolk in an attempt to make this more appropriate for non-Bedouins like us, whose sedentary lives could do without so much fat and cholesterol! This dish has a very gamey flavor. The next time I make this, I will cook the rice in water or vegetable stock instead of lamb broth. Medha did not like this dish. She complained that it had no flavor. What she meant was that she could not taste any of the spices that she is used to in my cooking. No ginger or garlic either. How true! So the next day, I added some powdered cinnamon to the buttermilk sauce and she ate it with less reluctance. My husband was surprised by the gaminess or heavy meaty flavor. But he enjoyed every bite of it! 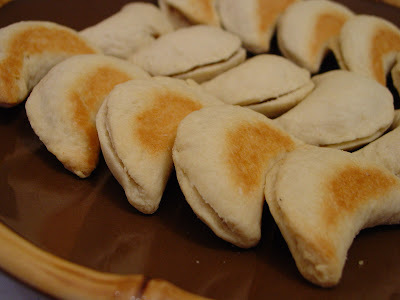 To go with this one-dish Jordanian meal, I made some delectable melt-in-your-mouth cookies. Forget-me-not Sambusik Cookies are what Diana Abu-Jaber calls these Jordanian delights in an ode to her childhood friend Hisham, who she met during the short period that her family returned to live in Jordan. I, too, have a forget-me-not experience associated with these cookies. Several, actually. It started with the preparation of these cookies. The ingredients call for 1 and half cups of ground walnuts. No brainer, right? Wrong. Think hours of grinding walnuts in the food processor. Walnuts release their oils when ground and so it had to be done in small batches and simply took forever! But I was so committed to these cookies that I didn't give up. Such is the power of The Language of Baklava by Diana Abu-Jaber! The camping trip I took them on was also another unforgettable and cold experience. Maybe it's got something to do with the cookies? Try it out, take them somewhere and let me know if you, too, had a forget-me-not experience! Stir the sugar into the clarified butter. by hand until smooth. 4 cups of flour is a lot of flour! I had to enlist larger hands to assist with the kneading. 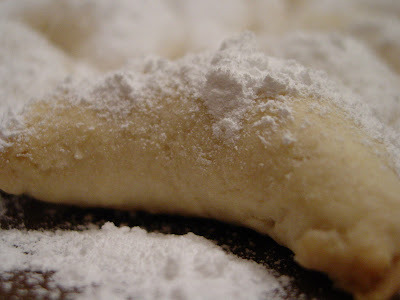 Roll out the dough to a thickness of about 1/4 inch and cut with a 2inch round cookie cutter. Combine all the filling ingredients and place a good mounded teaspoon of the filling on each cut-out cookie, fold it over, and pinch the edges closed. 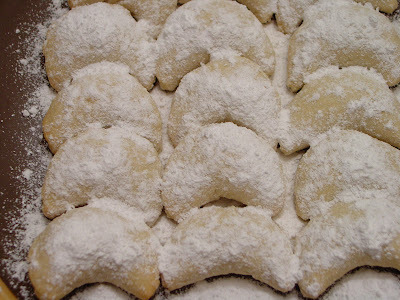 Traditional sambusik cookies are then curved into a half-moon shape. Bake at 350F for 15 to 20 minutes, until the cookies are lightly browned. Remove the cookies from the oven and cool. Sprinkle liberally with confectioner's sugar. Dig your teeth into these and enjoy these walnut filled cookies with a hint of rose flavor! Look at the ingredient list carefully. It is 1 and 1/2 cups of ground walnuts, not 1 and 1/2 cups walnuts, ground. It took about 4 cups of walnuts, possibly more, to yield 1 and 1/2 cups of ground walnuts. This was the part that took the longest. So if you decide to make these and you have a Middle-Eastern or Arab store nearby and they stock ground walnuts, jump at that chance. It will save you a lot of time! It might be a good idea to halve this recipe. That way one is dealing with only 3/4 cup ground walnuts and only 2 cups of flour. You won't go nuts grinding the walnuts like I did! And 2 cups flour is manageable for medium to small size adult hands! I wasn't really sure what Diana Abu-Jaber meant by curved into a half moon shape. To me, half a moon is a semi-circle. I thought perhaps she meant a crescent and so that is what I did. If you have had the real thing when it comes to Sambusik Cookies, do drop me a note to tell me where I could have done better. Ahem! Note the positive tone! This makes about 35-36 cookies. It was just the right number for our neighborhood potluck when we camped at Moraine Campground in Rocky Mountain National Park. They were a huge hit. We didn't stay the second night but the cookies did! I found Diana Abu-Jaber's Language of Baklava when Barbara mentioned that it was a memoir of an Arab-American girl who straddles two very different cultures while growing up, Jordanian on her father's side and American on her mother's. Diana Abu-Jaber relates her story with a lot of humor and punctuates them with well-written easy-to-follow recipes. I was hoping to learn something new from this book about raising an immigrant child in America, where values at home are sometimes radically different from that of the world I send her out into. I think I set my expectations too high in that respect because I couldn't find anything that I would do differently after reading this book. But the book itself makes for a wonderful and easy read! The recipes are an added bonus. I am sending these Jordanian delicacies to Meeta's Arabian Nights - Monthly Mingle. The cookies must taste heavenly...walnuts were just made for sugar. The addition of ghee can only make it even better. Manisha, the lamb dish looks yummy!!! We get fresh halal goat meat here in Seattle at the Pakistani and Middle Eastern stores, and frozen goat meat in the Indian stores. Check for a halal meat store in your neighborhood, if you can find goat it makes a big difference in Biryani and other meat and rice dishes like this one. Medha sounds so cute, normal desi kids complain about too much spices, and she says "no flavor". :) That is just too adorable. Yes indeed I have a recipe for Sambusik...it mentions two different fillings: the one you used, and a date filling (1/2 lb dates, chopped, cooked in 1/4 c butter in a pan until a paste forms, remove and stir in 1 t rosewater)...and the author, regarding shaping, says, "...and turn pastry over filling to form a crescent..." I think yours are just marvelous! Sweet little moons on a plate. great introduction to jordanian food. i hadn't heard of either of these two dishes. Anita, just like we have our regional variations, I think this is one such variation for Jordanians. 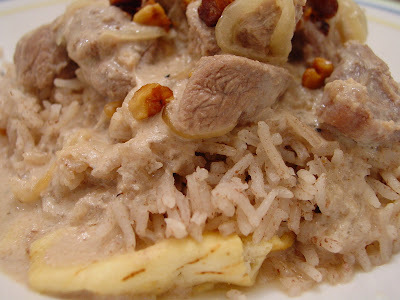 I found this recipe for Mansaf on Jordan Explorer. It has cinnamon bark, allspice and turmeric. The recipe I used is the Bedouin version. But I can see it becoming yakhni, too! The Sambusik cookies were very good. And no, they did not taste like baklava. The baklava we buy regularly has honey not sugar. The Language of Baklava has a recipe for baklava that I want to try. I love the story around that recipe - it revolves around an unmarried aunt who understands Diana's need to be who she is rather than conform. Sig, I have been told of a store nearby that stocks mutton. I need to find out when they get it and buy it before it is frozen. I love lamb but I do agree with you that some dishes taste better with goat meat. Now if only I could get Medha to start eating food that has more red/green chillies. Her taste buds can't seem to handle that as yet but she will eat cinnamon bark from pulaos and curries! Richa, patta pathav! BTW are you Reecha (Hindi-style) or Rucha (Marathi-style)? Oooh! A date filling sounds good, too, Pel! 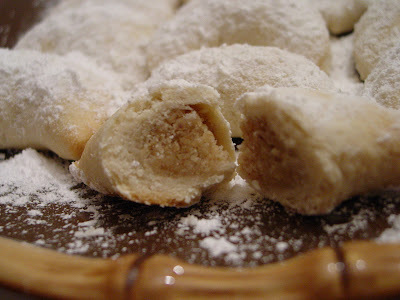 Indira has a recipe for a date filled cookie called mamoul. She makes them in the cutest of molds! Persians have a thing for rose-flavored syrup! Their faludeh also has it. Bee, all kinds of stirring ;-) This time though my husband helped stir. Check to see if your library has The Language of Baklava. Diana Abu-Jaber has a way with words where she makes pan-fired Velveeta Sandwiches sound enticing! Bedouin Mensaf Lebeneh and your Sambusik Cookies (that took a lot of careful typing by the way) look absolutely delicious (decadent! ), but yes I prefer goat to lamb. I am not "seriously" hurt but would have been had you not opened your comments by now. Ha Ha Manisha you fell for the oldest trick in the "Blog Comment Cookbook" get your host intrigued and they will visit you and ofcourse you did and I am doing a Victory lap here! Just kidding.. The first line in the post about your husband strangely sounded like mine "don't ask me to give you a hand and I will praise your food sky high" secondly when I say I am not upto cooking, daughter pipes in 'Let's order Pizza' husband dear who is not a big pizza fan offers to make Arsim Paruppu Satham (which is ofcourse Khicadi) so felt a strange sense of deja vu and hence the "NEED". The rest as they as they is what happens in a million households I end up cooking. nomadic folk who moved from place to place to graze their sheep or was it goat? How did they ever have time come up with such a deliciouis recipe? Chalk one up for ISG! Are you me? You're leading my life! Medha usually chimes in with pizza, too! And yes, I end up cooking! But to his credit, he stirred the buttermilk mixture and he pointed out that it must be simmered for an hour. And yes, the Bedouins are nomadic people. The author's grandfather was a Bedouin. The Bedouins are known for their food, their music and their hospitality. From what Diana Abu-Jaber writes, this mensaf lebeneh was served on huge platters with the choice meat pushed nearer to the guests. Notice the lack of spices though. From what I have been reading on the net, mensaf or mansaf is the signature dish for the Bedouins and it is made from dried yogurt as opposed to buttermilk used in this recipe, which has been adapted for western kitchens. Yogurt is drained, salted and then sun-dried for longer storage. This is called jameed. Here are some pictures of mansaf. Traditionally, the bread at the bottom is shrak - which is what you see the man making in those pictures. I've read that shrak is available in Middle Eastern bakeries now. Musical, this is but one version of Mensaf as I discovered. 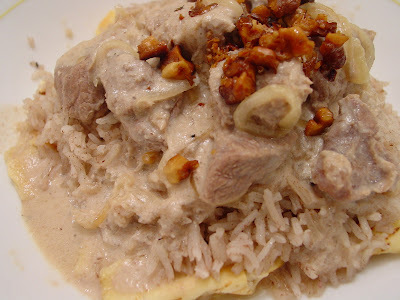 Mensaf or mansaf is the national dish of Jordan but other countries like Syria, Lebanon, Iraq and Palestine have their own version and these seem to have more spice. Next time, I will add more spices! Here's another great picture of mansaf cooking on wood fire. A foodie friend sent me the wonderful write up you did on Mensaf and The Language of Baklava. Thank you! 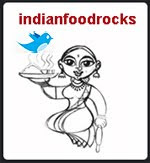 I'm so excited to know about your blog-- Indian cooking is one of my absolute favorites--and I was so delighted by your mensaf and sambusik cookery, I linked this page to my website under the "Writings" section, then click on Language of Baklava: http://www.dianaabujaber.com It's wonderful to e-meet you! Manisha! Wonderful creations and I am totally intrigued by the book! patta kontya pattya var pathvu? And it is the first one.. Both dishes look gr8 Manisha. But like Medha, I will not like something thats too meaty and has a game flavor. But the cookies look yummy. I've never tried cookies with filling, so will try to make these sometime, but like you suggested will try with half the recipe as its just 2 of us here. And for good goat meat I go to Haat Bazaar in Aurora which is just opposite HMART. Also what did you use to grind the walnuts? A spice grinder or blender? Well...straight to the point...when are u inviting for a dinner? Those dishes look heavenly, I would love Medha's version though. Diana, welcome to IFR! It's a real treat and an absolute pleasure to have you join us here!! I am a h-u-g-e fan of your writing and I take a lot of inspiration from you! Your recipes have been a wonderful introduction to a new cuisine. Thank you so much for mentioning IFR on your site - I am very honored! Musical, I wasn't totally true to the mensaf recipe - I used egg-whites instead of the whole egg and I used walnuts instead of pine nuts. Pine nuts would have been divine! Since Jordanian food is totally new to me - apart from pitas and falafel - I thought I'd stay as close to the recipe as possible and experiment later. As far as the cookies are concerned, there's not much you can change. Although do see Pel's comment where he says they are also made with dates and more butter! Isn't that picture fabulous?! I miss the smell of food being cooked on angeethis! Meeta, I am sure you will love this book. You will be able to relate to so much in it because you have lived in the Middle East. Richa, polarmate [at] gmail [dot] com. :-D And thanks for clarifying which one. You know how Maharastrians say oo instead of ee (how Krishna is Krushna and so on...) but who am I telling this to?! You're the Queen of Languages! Deepz, I was told that My India's on Baseline and 287 in Lafayette has mutton, too. Haat Bazaar has been recommended before, too! I really need to make that trip to Aurora! I used my Magic Bullet, which has since died, for the walnuts. My coffee/spice grinder is too small and it would have taken forever. And no, the walnuts did not kill my Magic Bullet! Shilpa, any time! Just let me get through yet another tax deadline! BTW, this time I am a little confused - which Shilpa are you? Can't be Shilpa of AR as she's not big on meat. Shilpa of EON's profile is not private. Do we have third Shilpa? If so, welcome!! And thanks for the jameed link...I think I may have discovered something about a cheese I think of often! hehe..i surprise u a lot these days Manisha. that was me Shilpa of AR, who does not love meat but simply loved your picture and felt like eating it :D.
The cookies look nice something like our karanjis. The outer covering becomes crisp after baking? thanks for the gesture anyway. very thrilling, Pel! I hope the glow brought some sunshine where you are. The 6-12 inches of snow missed completely and it's been rather cold. Do get hold of the book, I am sure you will love it! Anita, I also just read that in the time of Mahavir, Jains used to dip cloth in milk, dry it and then rehydrate it for later use. Let's try to make jameed together, what say? Shilpa, you signed in with another Blogger profile that is private. The day you eat gamey lamb will be a day to wait and watch for! Now go and enable that profile so this my poor head does not get confused again! Archana, now if only Shilpa will take a tip or two from you about this! The outer covering is not very crisp, it's more like a melt-in-your-mouth pastry shell. It is more khush-khusith than crisp. Richa said: No dear, why should I trouble you this much? But if we ever meet in the mountain of Colorado, I will definitely eat the cookies made by your (beautiful gorgeous) hands. Methinks you are scared I will send you rocks instead of cookies. :-D Colorado Rockies, yes! That's where we had sambusik cookies and they went very well with the whisky we were having neat in order to stay warm in that frightful wind and cold! The jameed project sounds like a fun idea!! But I will have to use regular milk...where am I going to get goat milk! Me, too! Also, I will have to wait till end of May for it to start really warming up before I can sun-dry anything. I'm guessing right now is the right time for you. Let's look for recipes and instructions and we each do it based on when it is suitable for us, weather-wise. Anyone else want to join in? Pel? Mushroom-drying Musical? Anyone else? Archana? Hi Manisha. Thanks for stopping by my blog. Glad to see someone has already attempted a couple of recipes from "The Language of Baklava." I'm printing your post out to tuck in the book. What's really strange is that I was randomly surfing the other day and ran across your blog (before you posted this entry). I bookmarked it to check out later, and then you stopped by mine! Small world. anyway gotta' go get some stuff done, a nasty noreaster coming our way tomorrow. My Mom confirmed that jammed/masheer kreyeh (that's what I'm going to call it, BTW) is a sun-dried cheese. It gets all chewy-stretchy on frying. I was on the right track. Pel, regarding the goats from Kashmir - no, none went to mutsch, not for us anyway - it was considered inappropriate for the in-laws (vegetarian Kobras) - they had to content themselves with zamudaud (ha, now try looking that up!). So...this "mashir kreyah"...does kreyah mean "dried"? Alright, Pel.. I've done this before,another one is called for - sashtang dandavat pranam :-). Totally, you are the man (even if you used Wiki)! I don't really think those terms have any meaning in Kashmiri. And the 'shakreyeh' sounded so similar to 'maseer kreyeh', that I would think that is where its roots lie. It is after all, supplied by the nomadic gujjars (the bakarwals - bakriwalas - goatherds) who must have migrated from Iran/Afghanistan to the Kashmir region. Manisha, I have two gmail ids as you know. I always forget to check with which id I am logged in. I log into blogger using AR id. But sometimes when I am logged into my personal id, I write comments and forget to log into AR id and post the comment :(. Its all so confusing. But I want my blogger identity and personal id totally different. I need to be more careful next time while commenting. To add to this confusion, I have one more professional gmail id :(. Salams, I love your blog so glad I found it. I cook mainly Arabic food but Indian is my weakness. I hope to learn a lot from you. Noor, welcome to IFR! I hope to see you around more!